Washing your vehicle is key to maintaining the glossy finish that you worked so hard to achieve. Washing a car involves more than just a bottle of dish soap and an old paint bucket – sit back, relax, and take a couple notes from Blackfire Wax on how to properly wash and dry your car. With our tips, tricks, and techniques, you can avoid instilling unsightly swirl marks and scratches into your vehicle’s delicate clear coat finish. First and foremost, put the dish soap back in the kitchen – it serves no place in your garage. Dish soap was acceptable for washing cars 50 years ago, but in the age of modern, scratch-sensitive clear coats, dish soap simply doesn’t cut it. A quality shampoo is a must, and we’ve got you covered with BLACKFIRE Wet Diamond Conditioning Shampoo. BLACKFIRE Wet Diamond Conditioning Shampoo is a pH-balanced, high-foaming shampoo that gently removes dirt and grime without stripping the wax coating off your vehicle. It rinses freely, leaving no residue behind, and it’s what we call a gloss-enhancing shampoo. Best of all, you only need 1-2 ounces to wash your entire vehicle, making it a great bargain. Arguably the best investment in car wash supplies is the Grit Guard Dual Wash Bucket System. This consists of 2 buckets, 2 dollys with a diamond plate dolly connector, 2 gamma seal lids, and most importantly 2 Grit Guard Inserts. Using the system is quite simple: You add water and soap to one bucket, and rinse water to the other. After you wash a panel, you dunk the mitt or sponge into the rinse bucket and agitate it against the Grit Guard Insert. This loosens, removes, and traps dirt particles, preventing cross contamination. Dunk your wash mitt in the soapy bucket, and continue washing. It’s that easy! Never wash your vehicle in direct sunlight! If you do, you’re asking for water spots, which can be difficult to remove. Pick a shaded area, and be sure you’re using a soft, absorbent wash mitt like the Micro Chenille Wash Mitt or even better, the Natural Sheepskin Wash Mitt. If you love your car like it’s an actual member of your family, consider picking up an Aussie Merino Wool Wash Mitt. 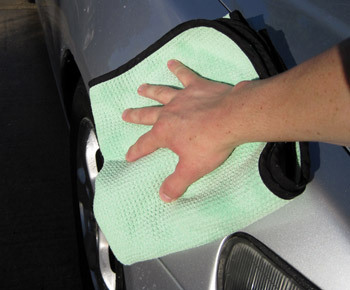 Microfiber and wool wash mitts trap dirt particles, keeping them away from your paint. If you have a large truck or SUV, the Montana Original Boar’s Hair Wash Brush is a must. Comprised of all-natural boar’s hair bristles that are flagged at the end, this super soft brush gently removes dirt and grime without scratching your paint. It is also available with an extension handle, making it easier to reach the roof and hood. 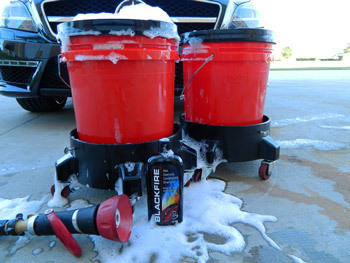 To remove bugs and tar, use BLACKFIRE All-In-One All Purpose Cleaner with a BLACKFIRE Bug & Tar Eliminator Sponge. This combination of cleaner and sponge safely removes stubborn bug and tar residue, leaving your paint squeaky clean. Always wash the wheels and tires first. This helps you avoid splashing dirt and grime onto painted panels that you just washed. If you’re like most people that are new to detailing, chances are pretty good you’ve been using the wrong wheel cleaner on your vehicle all this time. Wheels come in a variety of different finishes, and they must be treated with care to avoid causing permanent damage. 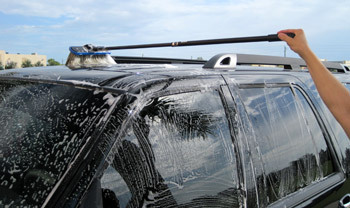 Other car care manufacturers offer a specialty cleaner for each type of finish. Trying to decide which one is right for your application can make your head spin! We decided to make it simple by formulating a wheel cleaner that is safe for ALL finishes – BLACKFIRE Total Eclipse Tire & Wheel Cleaner. As the name implies, this water-based cleaner removes grease and grime from tires too! MAKE SURE THE WHEELS ARE COOL TO THE TOUCH! Never clean wheels that are hot. First, spray the wheel with a strong jet of water to remove loose dirt and debris. Then, spray the cleaner directly onto the wheels and the tires – don’t forget the wheel barrel! This is the area behind the spokes, and is often overlooked by most people. Allow the cleaner to dwell for a couple minutes and then agitate using a combination of brushes. We’re big fans of the Speed Master line of wheel brushes, along with the Wheel Woolies. These both work great for cleaning the wheel barrels, in between the spokes, behind the brake caliper, and other areas that are difficult to reach. Clean the face of the wheel with the 8 inch Montana Boar’s Hair Wheel Brush. This brush is super soft and will not scratch painted wheels. Don’t forget the lug nuts! 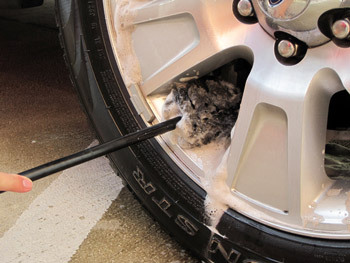 Use the Lug Nut Brush to clean the lug nuts and the cavity they sit in. Use a stiff bristled brush to clean the tires. Once the wheels and tires are squeaky clean, proceed to washing the body of the vehicle, starting at the top and working your way down. As mentioned earlier, be sure to rinse your wash mitt in between sections in a dedicated rinse bucket equipped with a Grit Guard Insert before reloading with soap solution. 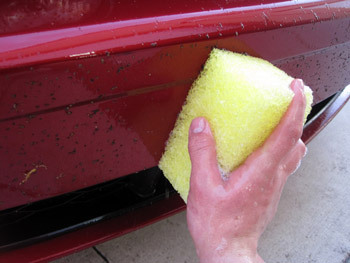 Doing this step is critical to preventing swirl marks and scratches. Use a Montana Boar's Hair Car Wash Brush to quick and easy wash large trucks and SUVs. 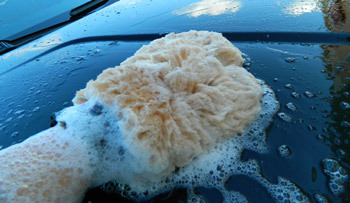 As you work your way around the vehicle, be sure to rinse often, so you avoid having soap dry on the finish. Rinsing will also help reduce the chance of water spots. Always wash lower body panels last to avoid overloading your wash mitt with road tar, soot, oil, and heavy grit particles. Now that the car is clean, how do you dry it? Easy! With a Cobra Guzzler Waffle Weave Drying Towel! The Cobra Waffle Weave Guzzler features only the highest quality Korean microfiber that goes through a unique manufacturing process to ensure that it meets the quality standards of a Cobra towel. As part of this manufacturing process, the microfiber goes through a splitting machine to make what's called "ultra microfiber". Ultra microfiber is found in every Cobra Waffle Weave Guzzler drying towel because it's the softest, most plush type of microfiber available at any cost. No corners were cut in the design of the Waffle Weave Guzzler and that includes the borders, which are super soft so they won't scratch even the most delicate of painted finishes. For most applications, a 20 x 40 inch is the perfect size to remove the majority of the water. Once the vehicle is 95% dry, switch to a second drying towel to clean up any spots you missed. An even more effective means of drying your vehicle is with a Metro Master Blaster. The Master Blaster features two twin-fan, 4.0 peak horsepower motors. What does all that translate to? It means that you can completely dry your vehicle without the use of any towels because the Master Blaster blows clean, dry, warm, filtered air at up to 58,000 feet-per-minute. Not only does this allow you forgo the drying towels, but it also blasts water out of cracks and crevices. The Master Blaster features two switches. Turn the first switch on, and you'll say WOW. Turn the second switch on, and you will be speechless. Not only will you be impressed with the sheer power of the unit, but the made-in-USA build quality is refreshing. After you finish drying the vehicle, apply Midnight Sun Instant Detailer to amp up the gloss and protection. This step on takes a couple minutes and is well worth the additional time and effort. Apply Midnight Sun Instant Detailer with a Supreme 530 Microfiber Towel. If the traditional way of washing your car doesn’t light your fire, consider picking up a Foam Gun. The idea behind a foam gun is that it presoaks the vehicle in suds to start loosening grime and lubricating the paint right away. And truth be told, it's a lot of fun to use a foam gun. 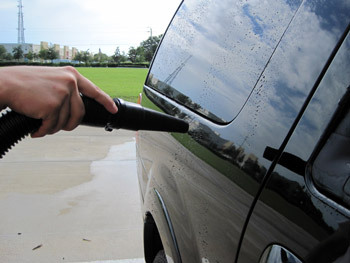 The Foamaster Foam Gun works with your water hose to deliver the soapy water to the vehicle. The Foamaster's tip helps boost water pressure to put a little power behind the delivery. The Tornador Air Foamer HP is a high powered foam gun that works with any air compressor capable of producing 60-90 psi. The Tornador uses very little water so it's a good idea to hose down the vehicle first. Then let the foam fly! The Tornador creates fluffy, air-filled foam. The Foam Cannon HP works with a pressure washer. The Foam Cannon HP blasts a mixture of water and soap through the tip at a high pressure to release a lot of grime immediately. This foam cannon uses less water than a hose, but packs a lot of pressure. The foam produced is not as light as the Tornador, but it clings very well. Check out all the great tools and products we have to properly clean your vehicle right on our Wash & Dry page! BLACKFIRE Instant Detailer 32 oz.